E&T Services maintains a comprehensive selection of utility-specific professional management and technical training programs for utility employees. TVPPA conducts training at regional locations and on-site. The mission of the Education & Training Committee, a standing committee of the TVPPA Board of Directors, is to provide guidance and oversight to TVPPA in the development and delivery of nationally recognized education and training opportunities to meet current and future electric utility workforce needs. NOTICE: Effective January 1, 2019, TVPPA must begin charging sales tax on materials sold to businesses in Tennessee unless the business has a tax-exemption form on file with TVPPA’s accounting department. Please contact accounting@tvppa.com for additional details. 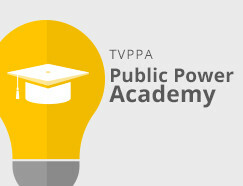 Register online and login to our Public Power Academy. Curious about upcoming training events? View our training calendar. Questions, comments, complaints? Find your correct training contact. Sign-up for eResource for information and upcoming training events. Click here for directions to training areas and recommended hotels. Cancellation or policy questions? View our policies and procedures.